Below, you see a complicated Xiangqi problem. It appeared in Variant Chess, Jul-Sep 1993 issue. This problem is described in a report on the UK Championship Xiangqi. C.K. 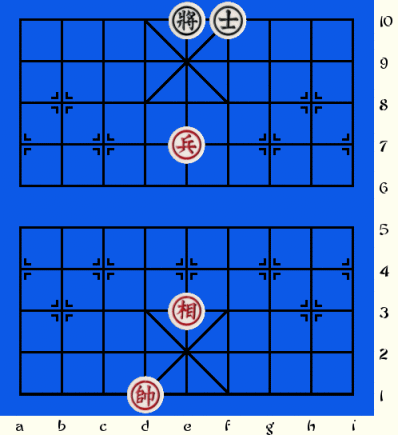 Lai presented this problem there; it appears in one of his books on Xiangqi. Red to play and win. Red has a pawn and an elephant, and black has a mandarin. Click on the image to try the problem with Game Courier. If you can't solve it, you can click the Solution button in Game Courier for the solution. Originally written by Hans Bodlaender. Adapted to Game Courier by Fergus Duniho. Author: Hans L. Bodlaender and Fergus Duniho. Inventor: C. K. Lai.